It might happen to every freelancer at some point. The client delays, forgets, or outright refuses to pay you for work you've done. Whether you're a freelance graphic designer or copywriter, you're probably reading this because you have a client who hasn't paid for that project you worked so hard on. When it comes to making sure you get paid, you have several options from simply following up to taking your client to court. But as with any business dealing, it's best to start with the least damaging route. The first step is always to reference your contract. Hopefully, you took the time to create a contract that you and your client both signed before starting the work. In that contract, you stated the payment terms such as how much you were to get paid and when. You also stated the late fees that would be charged if the client failed to pay within your time frame. If you did all of this and you sent your invoice only to find that you are still waiting to be paid, go ahead and send the invoice a second or even a third time. Follow up invoices are perfectly acceptable, but don't start sending your invoice on a daily basis. Send an invoice and wait a couple of weeks before moving on to the next step. You can even send a polite note with your mailing to let them know you're re-sending the invoice. A simple note could say that you're re-sending in case the client didn't receive your first invoice. Things do get lost in the mail so even if the client is avoiding you, this simple act of following up shows that you're giving your client the benefit of the doubt. You might find a check in your mailbox by the end of the week. Or, your suspicions about avoiding payment may be confirmed. If you're dealing with a client who won't pay and you don't have anything in writing, send them a letter along with the same lines as you would if you had a contract. You can tell the client you agreed on a payment amount and the terms and you're just writing to follow up to see when the check would be sent. Most freelancers aren't dealing with the person who pays the bills for the advertising agency or client company. You may be dealing with a contact person in the creative department because that person knows what's going on with the project, which likely means that you're not dealing with the person writing the checks and balancing the books. A letter or email to the company's business manager, with a copy of your invoice and signed contract (showing both your signature and the clients), will generally do the trick. You can find out who the business manager is by calling the company and asking for that person's name. Don't go into detail about who you are or that you want to talk to that person. Just find out the business manager's name and contact information. In your letter or email, tell the business manager the date you completed the project and that you have included a copy of the contract both you and their company representative signed as well as the outstanding invoice. Be courteous and professional, but don't also hesitate to state how many days the invoice is past due. 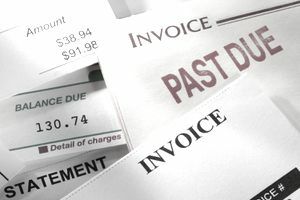 If you've added late charges to the bill because your initial contact person didn't respond with a payment, consider dropping those late charges and letting the business manager know that you are willing to do so if the bill is paid promptly. You can even set a date by which you require payment to keep those late charges from being added to the bill. Even though your right to collect late fees may be stated in your contract, this act of goodwill can result in faster payment and fosters the possibility of a continued working relationship with the company. Sometimes a phone call is more effective than several letters or emails. If you're ready to make a call, contact the business manager. When you get in touch with this person, you can ask if they received your letter or email. This question will open the door for them to discuss your situation. They'll say they have no idea what you're talking about, tell you the check's in the mail, or they'll start telling you why they're not planning on paying you. If they say they don't have any idea what you're talking about, offer to resend the information. If the check is on the way, tell them you're glad to hear it and look forward to receiving it. If they say they're not planning on paying you, find out their reasoning. You may be able to resolve the issues in that very conversation. If you find that you're still struggling to agree and it looks like you're not going to get paid, the next logical step may be a final, certified letter. You can send a certified letter to a particular person to make sure you're invoice and letter is received or even to let them know you're planning on taking this to the next logical step in your pursuit of payment. What you'll often find with certified letters is that they're often ignored. Certified letters are more beneficial to you when you're prepared to take the battle to court. Your certified letter can let the client know you're about to file a lawsuit to get the money you're owed. Tell them if you don't hear from them by a certain date, you're headed down to the court to file the papers. Just be sure you give them another reasonable amount of time and don't send your certified letter on a Monday with the demands that you receive your check by Friday. Your professional attempts to rectify the situation have gone unnoticed, and it's clear this client is going to avoid paying you at all costs. This is the time when you take your battle to court if you're interested in pursuing the situation further. Many lawyers will give you advice for free on the phone on how to handle your case. Unfortunately, if you're at this stage, you're standing at a point in the road most freelancers don't want to deal with. You should get paid for the work you've done, but are you willing to take your client to court? Is it worth the time, effort, and attorney fees? Your final decision is to choose between filing a lawsuit or writing this whole experience off and moving on without taking any legal action. Thankfully, most freelancers find that their payment issues can be resolved with the business manager and they don't have to deal with phone calls, certified letters, or lawsuits. If you've followed the rules of professionalism and courtesy, the client shouldn't have any problems dealing with you in the future. But the real question is--do you want to do business with them? If you are going to have to fight for your money every time you complete a project, you may find it's better to let that client deal with some other freelancer. Sometimes it's best to be the one to walk away from a troublesome client, or you may find yourself dealing with this very situation again.